E-comic readers rejoice, you can now sync your digital Marvel Comics and comiXology accounts into one big happy e-collection. By heading over to comiXology's new info page, comic fans can sync up both their accounts together. 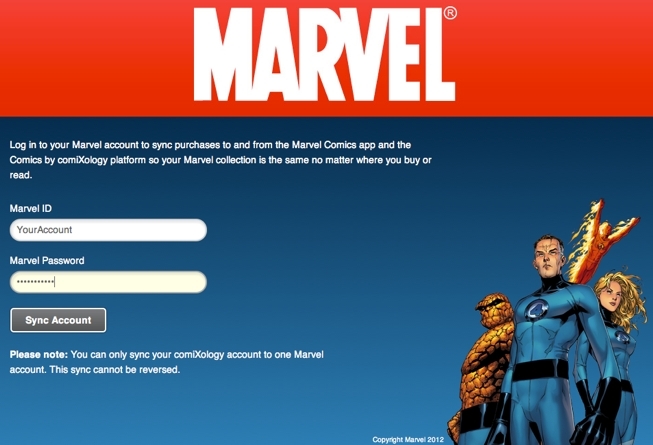 The site will ask for your Marvel login info- just enter that and like magic your digital books will sync up automatically across the Marvel storefront and the comiXology App. The move makes sense considering that the two companies just entered into a multiyear digital distribution deal this past May. comiXology is now the exclusive distributer for the House of Ideas' english language books across the globe, in case you didn't know. The consolidation (though the Marvel dedicated App isn't going anywhere, so don't worry) just makes sense and basically means that readers have one more way to get their fave characters graphic novels and individual issues on their device of choice. If you'd like to see what all the fuss is about, you can visit comiXology by clicking here, or nab yourself the Marvel Comics App here.